The Surface Laptop will lead a new generation of ultraportables. Windows is taking aim at Chromebooks yet again, but with Windows 10 S, Microsoft’s leading the charge with a Google Chromebook Pixel-like ‘halo’ PC of its own: the 13.5-inch Surface Laptop. Yes that’s right, laptop. 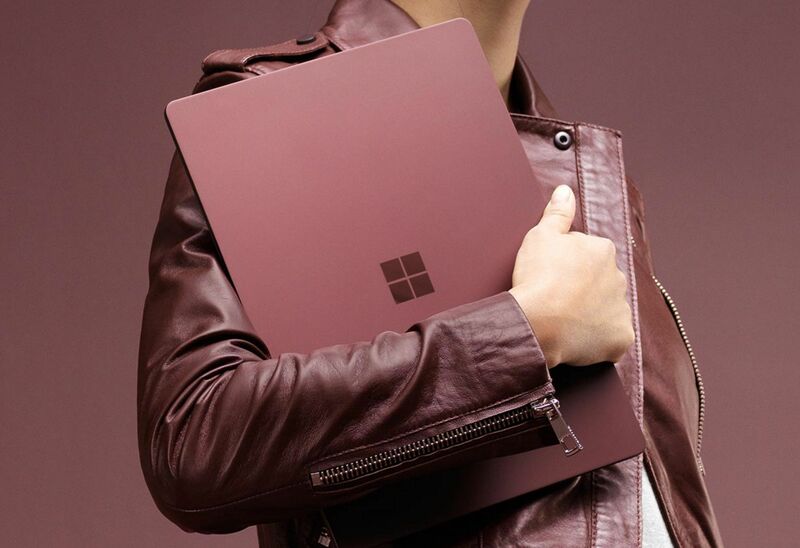 Unlike the convertible Surface Book and Surface Pro, the new Surface Laptop sticks to a traditional clamshell notebook design. One glance confirms it’s a Surface device, though. The laptop’s keyboard features the same Alcantara material used on Microsoft’s $160 Signature Type Cover for the Surface Pro 4, and the same large 3:2 aspect-ratio displays of modern Surface devices. Another similarity: That 3.4-million-pixel display features Microsoft’s PixelSense technology, which gives it full access to Windows 10 S’s wide range of inking and touch capabilities. Those finger-friendly abilities should prove doubly handy in schools, and that’s the whole point. Much like the original Surfaces highlighted Windows 8, and the gorgeous Surface Studio exists to exalt Windows 10’s inking chops, this new Surface Laptop is Windows 10 S’s paragon. It’s preloaded with a slightly tweaked operating system, which works only with apps from the Windows Store to improve battery life and reduce software headaches. Traditional desktop apps will work with the Surface Laptop, but only if they’ve been wrapped in a Windows Store package first, like Evernote and Arduino IDE have been. Windows 10 S also allows you to upgrade to Windows 10 Pro if you want to expand beyond the Windows Store to use desktop software. The upgrade’s free until the end of the year, or $50 after that. The Surface Laptop sticks to the usual Surface swankiness under the hood. It’s powered by Intel’s powerful Core i5 and Core i7 processors, paired with up to a 1TB PCIe SSD directly integrated into the motherboard to improve energy use (and decrease user repairability). Speaking of battery life, the Surface Laptop boasts up to 14.5 hours of endurance, and it won’t lose any of its charge when it’s not being used. Microsoft’s notebook wakes and sleeps instantly when opened and closed. “Leave your charger home and go to school, then go to the library, then go home and binge-watch Netflix,” Surface head Panos Panay proudly declared. Physically, the Surface Laptop weighs a mere 2.76 pounds, with a 14.5mm thickness. The notebook mimes Chromebooks even more with its limited port selection. 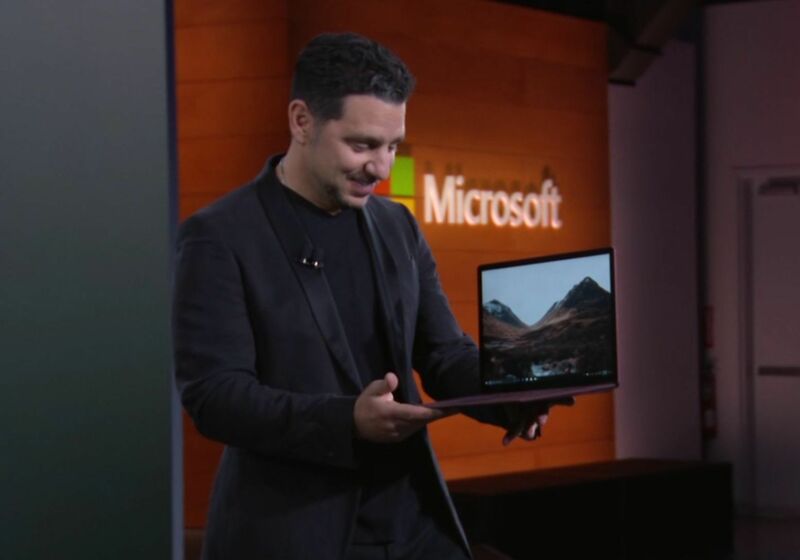 The left side features a USB port, a mini-DisplayPort, Microsoft’s proprietary Surface charging connector, and a headphone jack, while the right edge lacks any ports—not even an SD card reader. The Surface Laptop will be available in Platinum, Burgundy, Cobalt Blue, or Graphite Gold when preorders launch today and starts shipping on June 15. It’ll start at $999 for the entry Core i5-equipped model. Wait, how much? Don’t expect Microsoft to move many Surface Laptops in cash-strapped public schools at that price. The Surface Laptop’s clearly a halo product inspired to prod other PC vendors towards Windows 10 S, much like the Chromebook Pixel was. (And no, Google’s laptop didn’t sell in droves.) But with the ability to install Windows 10 Pro over Windows 10 S at will, this new Surface may just prove popular with college students—and anybody else—who might otherwise be swayed to Apple’s MacBook. 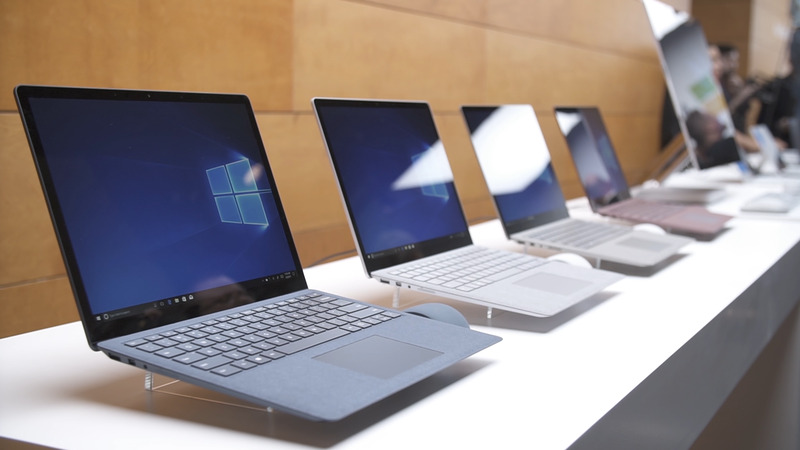 After the event, Microsoft revealed the configurations available for the Surface Laptop. The Core i5 version packs Intel’s integrated HD 620 graphics. The entry level $999 model packs a 128GB SSD with 4GB of RAM, and is only available in Platinum. The step-up $1,299 Surface Laptop offers the full palette of color choices, as well as a 256GB SSD and 8GB of RAM. The Core i7 Surface Laptops include Intel’s HD 640 graphics and is only available in Platinum, at least for now. 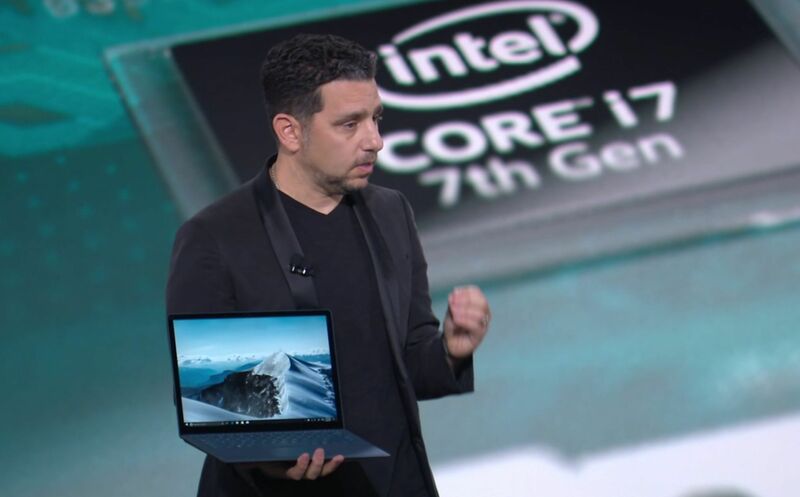 The base $1,599 Core i7 version includes the same storage and memory configuration as the high-end Core i5 model, while the priciest Surface Laptop bumps that up to a 512GB SSD and 16GB of RAM for $2,199. There’s no sign of the 1TB storage option that Panay touted in his reveal.